Janet Donnelly, of Overbrook, won $50 scrip money with a ticket obtained at Swisher Automotive, Overbrook, this week in the Christmas on Us contest. OSAGE CITY—Another winner in the Christmas on Us promotion stepped forward to claim $50 in scrip money, but five $50 instant prizes remain to be won, before the final drawings Dec. 17 at Osage City High School auditorium. 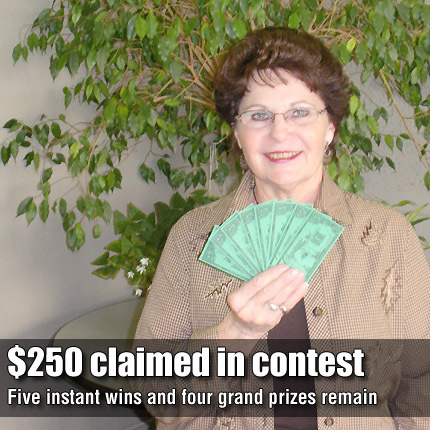 Janet Donnelly, Overbrook, was the only ticket holder to claim a prize last week, although there were three ticket numbers hidden within last week’s advertisements. Donnelly’s ticket was pulled from those collected at Swisher Automotive, Overbrook, and the number was hidden in the Lamont Hill Restaurant advertisement. Donnelly said she wasn’t sure yet where she would use the $50. One of last week’s unclaimed numbers was located in an ad for Four Corners Steakhouse, Scranton, and was drawn from tickets at Osage Building Materials, Osage City. The other unclaimed number was on a ticket distributed by Carbondale Tire and Auto, and hidden in the ad for Furniture Loft, Osage City. Five $50 instant prizes remain up for grabs as of the third week of The Herald-Chronicle’s Christmas on Us promotion, four numbers are hidden in week’s ads. The countdown is under way for the grand prize drawing for two $1,000 prizes, and two $250 prizes, to begin at 9 a.m. Saturday, Dec. 17, at Osage City High School auditorium. Everyone is invited before the drawing to enjoy donuts and coffee, served in the school cafeteria, beginning at 8:15 a.m. The Santa Fe Trail Choraliers will add to the holiday entertainment. A new twist to this year’s grand prize drawing is the addition of door prizes “with a twist,” although the newspaper staff is keeping details under wraps. See pages 2B, 3B, 4B and 5B of this week’s Herald-Chronicle to find hidden ticket numbers in the ads and a complete list of rules. Through the Christmas on Us giveaway, Osage County merchants are making sure that shopping at home pays. For every $10 spent at participating merchants, shoppers get a ticket. Those who don’t buy, or who are just looking, can get a free ticket each week by stopping by The Herald-Chronicle’s office. No purchase is necessary to win. You must be present at the grand prize drawing to win, and the scrip money is only good at participating merchants. It is simple to win but tough to decide where to spend the winnings with the 37 merchants participating in the countywide contest.